Since forever altering the course of the youth ministry world with his best-selling, groundbreaking book, Purpose-Driven® Youth Ministry, Doug Fields' mind-but especially his heart-has been focused on the many unique needs of new youth workers.Doug translated his passion, insight, and vision for his beloved "rookies" into what you're now reading, Your Fist Two Years in Youth Ministry-hands-down the most comprehensive companion to not only surviving, but also thriving, during the most crucial phase of youth ministry. Employing his renowned wisdom and humor-as if you and Doug were chatting over a long, relaxing meal-the author disarmingly relates stories and principles from his own successes and failures over 20-plus years in youth ministry. In the end, he offers treasure troves of practical advice, all in the hope that new youth workers can travel a smoother path and achieve real longevity in a church culture that all too often chews them and spits them out.Doug covers all-important issues such as:·Dealing with discouragement·Establishing a solid spiritual foundation·Building effective relationships with students·Resolving conflict·Ministering to parents and families·Trailblazing change·Working with volunteers·Defining a realistic job description·And many others!In addition, a chorus of insightful sidebar voices joins your conversation with Doug, among them ministry veterans Jim Burns, Steve Gerali, Mike Yaconelli, Helen Musick, Chap Clark, Marv Penner, Rick Warren, Jana L. Sundene, Bo Boshers, Duffy Robbins, Tony Campolo, and Richard Ross, all who've composed extensive, topical essays for each of the dozen chapters.Your First Two Years of Youth Ministry is a must-have tool for new youth workers, volunteers, seminary professors and students, senior pastors, elders, church boards-even veteran youth workers who've been ministering in unstructured environments and are now asking, "What did I miss? What can I still learn? "The first two years of youth ministry are never easy. But never fear. Doug fervently assures us: "Hang on. Hope's coming!" 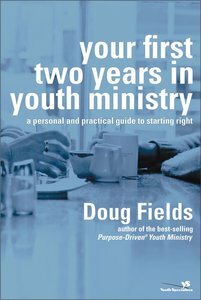 About "Your First Two Years in Youth Ministry"
Customer Reviews For "Your First Two Years in Youth Ministry"